And once again, in this Manichean good-versus-evil, us-versus-them, black-versus-white, world that we are told we live in, we are expected to take ‘sides’, and either jump for jingoistic joy as we thump our chests screaming, ‘USA! USA!’, or else mourn the death of a ‘martyr’. And once again, many people, myself included, will have to take a deep sigh and wonder whether we can ever successfully explain, to an increasingly polarized world, the complexity of our stances and the nuances of our positions. The fact of the matter is, contrary to what both bin Laden and his one-time nemesis Bush propagated, we don’t live in a stark black-and-white world. We live in a very colorful, very multi-faceted world. Because I refuse to see everything in black-and-white, my position is neither one of sorrow nor one of elation. It is not one of sorrow because I never viewed bin Laden as someone worthy of my reverence. He was a reactionary who lacked wisdom and who had no long-term vision. His response to Western imperialism was a visceral rage expressed in the language of a false pseudo-jihad – an understanding of ‘jihad’ that he himself invented, and not one that the trained scholars of our glorious religion shared with him. He helped formulate and propagate ideas that caused more bloodshed in Muslim lands, and more civil war, than any non-Muslim invasion in the last decade. Suicide bombers claiming allegiance to him cheerfully bombed men, women and children inbazaars in Baghdad, in shrines in Karachi, in sky-scrapers in New York, and in markets in Kabul. Through his rhetoric of takfir, hundreds of people who were deemed ‘co-operating’ with the enemy were considered permissible to slaughter, and if a few thousand innocent bystanders needed to be killed in order to get to those handful, so be it. This was to be a permissible form of ‘collateral damage’ – one that seems to provoke only a fraction of the ire from those who harp on and on about Western collateral damage. (For the record, both are evil, and both need to be condemned; and again for the record, the ‘collateral damage’ of Muslim extremists groups is far more severe than the ‘collateral damage’ caused by Western drone attacks). His death was expected, for his own words and deeds called for action against him from a powerful military and a mighty country. So I feel no personal grief at his death. After all, he was already largely irrelevant in the Arab and Muslim world. What good did all of his fiery rhetoric ever do for the Palestinians he claimed to have been fighting for? And what impact did he have amongst the Arab masses as they all rallied together (and continue to do so) against their brutal dictators? From the alleyways of Benghazi to the maydans of Cairo, and from the mosques of Damascus to the streets of Sana, not one protestor waved the flag of Osama or chanted slogans of al-Qaeda. It was the peoplewho brought about real change, not Osama with his anti-American rage and calls for violence. Yet, I cannot cheer his death either. Why? Firstly, because the intentional taking of another human life is not a cause for cheering. Even if a murderer is legitimately executed (qisas) by the State for his crimes, it is not in our religion to rejoice at such a death; therefore how much more so when the death was caused in this fashion? (By this I mean that I would have preferred a live capture and public trial – but then again, at this stage we do not know the circumstances of his death). Therefore, the real question for me is not whether we should rejoice or not. The real questions are far more profound and difficult to answer. Now that we have killed bin Laden, will his death extinguish his ideas and truly make the world a safer place? 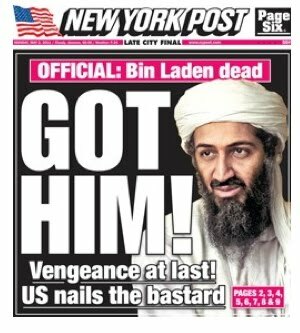 Now that we have killed bin Laden, will the anger that millions of people around the world feel towards our foreign policy simply dissipate into thin air? Now that we have killed bin Laden, will that justify the trillions of dollars that we have spent on our two wars in Iraq and Afghanistan, and the hundreds of thousands of dead since 9/11? Now that we have killed bin Laden, will the hysteria being propagated by the Right and the Islamophobia that is rampant across Europe and America subside? Now that we have killed bin Laden, will we start concentrating on far more important domestic and international issues? I guess the bottom line is: now that we have killed bin Laden, has status quo really changed all that much? I don’t have answers to all of these questions, but these are the questions that need to be asked before we rush to celebrate his death or, as some overzealous Muslims are doing, label him a shahid. (And on a theological note, I remind our readers that only Allah assigns Heaven and Hell to anyone, so let us not challenge this right of Allah by proclaiming anything about any individual’s fate in the Hereafter). It took America – the most powerful and technologically advanced country on earth – a full ten years to find this one man. How great it would have been if we had managed to capture the perpetrators of 9/11 back then! But our own reactions to 9/11 created a whole list of new issues, both domestic and international, that the killing of bin Laden will not solve. And to make matters even worse, in that decade a new generation, a young generation, has come of age – a generation for whom 9/11 evokes barely a memory. For this young generation, the death of bin Laden does little to solve its own problems. If we have learned anything from the Arab protestors across the Middle East, it is that change has to begin from within, and the best way to fight for the change that you believe in – even if that fight be against powerful regimes – is through nonviolent means. Killing your enemies doesn’t solve problems; working proactively and productively to gain the world’s sympathy when clear injustices have been committed does. A blogger friend of mine wrote that it is as if America is playing a game of chess with a small group of radical Muslims. We are not playing this game ourselves, for we are spectators. We understand both players very well, and both have made ridiculous moves in the past that have caused many unnecessary pieces to be lost. America has just made its latest move.